5th - 9th: Thank you for joining the NAC Fly Away Team on what promises to be another spectacular four day flying tour of one of the most beautiful regions in our country. You can look forward to exquisite cuisine, beautiful wine farms, languid golden honey, breathtaking views and stunning sunsets. Click here to download your NAC Fly Away Information Pack which contains the schedule of events. Please feel free to contact Deneys Potgieter on +27 82 891 4354 or e-mail deneys.potgieter@nac.co.za should you require any additional information. We can't wait to share this adventure with you! 23-25: Aero Club safety campaign, Limpopo. 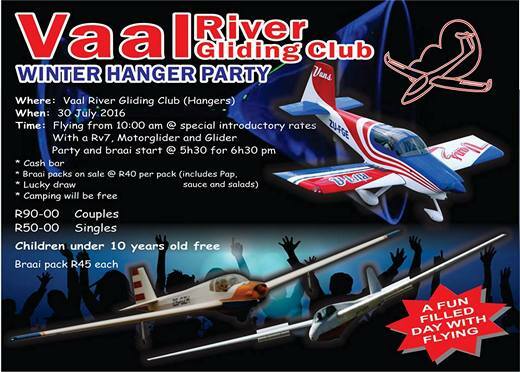 Tuesday 23 August Polokwane airfield club house evening. 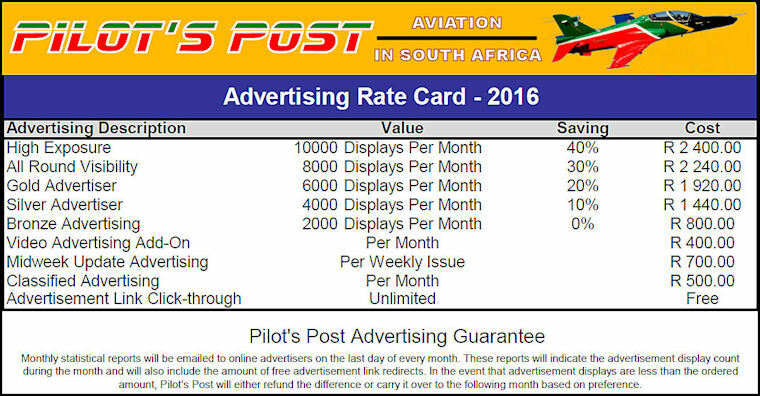 Wednesday 24 August Tzaneen airfield club house evening. 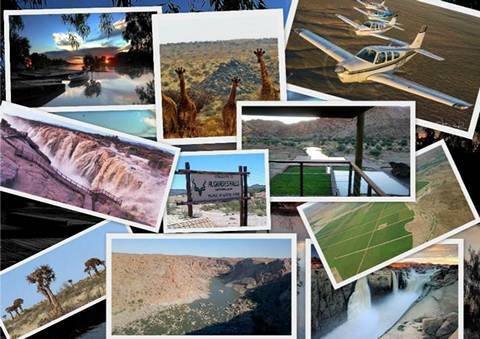 Thursday 25 August Hoedspruit airfield club house evening. 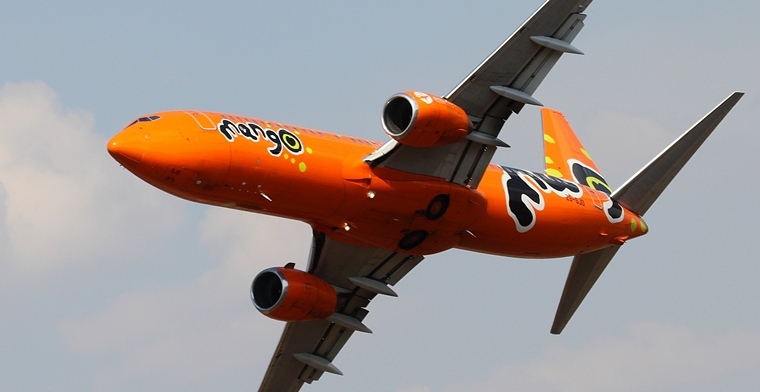 Boeing [NYSE: BA], South African Airways (SAA) and low-cost carrier Mango today celebrated Africa's first passenger flights with sustainable aviation biofuel. The flights coincided with Boeing's 100th anniversary and centennial celebrations worldwide. The SAA and Mango flights carried 300 passengers from Johannesburg to Cape Town on Boeing 737-800s using a blend of 30 percent aviation biofuel produced from Sunchem's nicotine-free tobacco plant Solaris, refined by AltAir Fuels and supplied by SkyNRG. "SAA is committed to a sustainable future and this flight highlights the bold steps we are taking to protect and preserve our environment while creating opportunities for the economic development of our people," said Musa Zwane, acting CEO of SAA. "We are pleased to join the ranks of global airlines who have made a commitment to a better and cleaner way of flying." "It is fitting that on our 100 year anniversary we are flying on fuels ?that not only power the flight, but ensure a sustainable future for our industry," said Miguel Santos, managing director for Africa, Boeing International. "This project is a great example of environmental stewardship that delivers economic and health benefits to South Africa." In 2013, Boeing and SAA launched their sustainable aviation fuels collaboration and in 2014, Project Solaris became the first focus project that converted oil from the Solaris plant seed into bio-jet fuel. In 2015, farms in Limpopo Province of South Africa, from which the biofuel for today's flights was sourced, achieved certification from the Roundtable on Sustainable Biomaterials (RSB), one of the strongest sustainability standards in the world. RSB certification provides a model for expansion of Project Solaris to larger scale production. The initiative also focuses on South Africa's goals for public health, rural development and economic and employment opportunities for farmers by increasing production of Solaris and other feedstocks on under-utilized land. The partners today also launched a stakeholder and sustainability plan called the Southern Africa Sustainable Fuel Initiative (SASFI) to ensure a long-term domestic fuel supply for SAA and other regional fuel users. The goal is to scale-up over the next several years to gain additional biofuel capacity. If successful, farmers will be able to tap into local and global demand for certified feedstock without adverse impact to food supplies, fresh water or land use. Studies have shown that sustainably produced aviation biofuel emits 50 to 80 percent lower carbon emissions through its life cycle that fossil jet fuel. Airlines around the world have conducted more than 2,500 passenger flights using various forms of aviation biofuel since it was approved for commercial use in 2011. On 12 July 2016 a Cessna 182 off from Essex County Airport Caldwell, New Jersey on a record breaking flight. What made this 182 different is that it is powered by new generation of compression ignition engine, purposely-designed for aeronautical applications. The engine, developed by SMA, a 100% subsidiary of Snecma (Safran), use an aviation biofuel blend and its installation on the C182 is FAA and EASA approved under a Supplemental Type Certificate (STC). On board was Ross Mc Curdy, a high school teacher in Rhode Island, Thierry Saint Loup, an executive at SMA Engines (Safran Group). 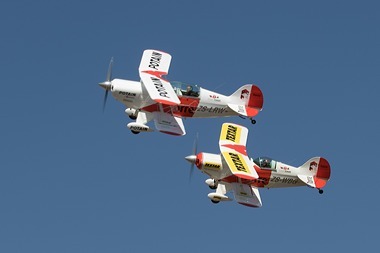 They flew a triangular course of 848 Nm (1572 km) in 9.1 hours burning 56 gallons of aviation biofuel blend or 6.18 gallons per hour resulting in an efficiency of 15.1 Nm per gallon (17.4 mpg), a world record in its class (pending standard review process). Due to its high efficiency, this engine allows the C182 to fly up to 1300 Nm non-stop, or to carry more payload for shorter missions, a significant advantage over the Avgas engine it replaces. Cessna Aircraft Company, a subsidiary of Textron Aviation Inc., a Textron Inc. (NYSE:TXT) company announced it has recently received certification for and is now offering hard point provisions for the Cessna Grand Caravan EX. These hard points expand the aircraft's versatility by allowing operators additional mission capabilities such as extended range with additional fuel tanks, increased cargo space, agricultural operations and the ability to configure the aircraft for missions that require armament. The company will be displaying a mock-up of a Grand Caravan EX wing with hard points at the Farnborough International Airshow the week of July 11. "It's essential that we continue to tailor solutions for our special mission operators' needs. The hard point wing structure furthers the Grand Caravan EX's already legendary versatility by adding more mission flexibility to the platform," said Tom Hammoor, president, Textron Aviation's defense company. "The Caravan platform is operating in many special mission roles around the world and accounts for a large percentage of our worldwide Caravan fleet." 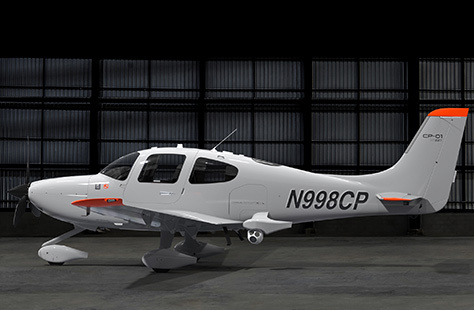 Cirrus Aircraft today announced it has received FAA certification for Cirrus Perception®, an adaptable, cost-effective special mission platform tailored specifically for both the Cirrus SR22 and SR22T aircraft models. This new multi-mission, adaptive Intelligence, Surveillance and Reconnaissance (ISR) aircraft expands Cirrus Aircraft's global portfolio by offering unique performance capabilities suitable for airborne traffic and law enforcement operations, aerial surveying, mapping and photography, search and rescue missions, disaster management and support, border surveillance and more. The Minnesota State Patrol has purchased the first Perception aircraft and represents a significant launch customer for the new solution. "Special Mission operators are constantly looking for ways to increase their capabilities while reducing operational costs," said David Moser, Vice President of Fleet and Special Mission Sales at Cirrus Aircraft. "Cirrus Perception delivers on both fronts and sets the new global benchmark as the most capable, flexible and cost-effective ISR platform available today." Cirrus Perception starts with the most sophisticated models of single engine aircraft in the world, the Cirrus SR22 and SR22T, equipped with the Cirrus Perspective® by Garmin® avionics suite. 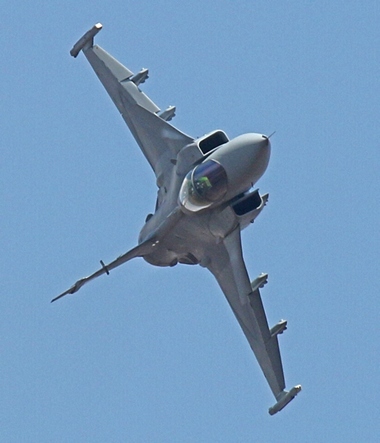 Operators have the opportunity to tailor the aircraft to host an array of lightweight, compact sensor and user-station options including multi-spectral imaging systems with ultra long range and electro-optical infrared capabilities. The Cirrus Sensor Mounting System (SMS) can accommodate a wide array of third-party sensor models and is designed to be modular, removable and reconfigurable. 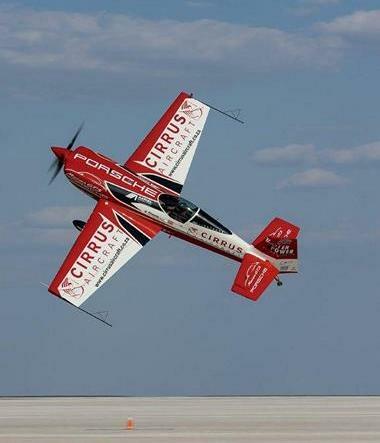 Cirrus has also partnered with expert third-party companies who will be able to deliver comprehensive equipment and payload integration services for Perception customers. The market introduction of the Perception platform provides special mission customers with the most technologically advanced and cost-effective aircraft available. Missions that would have formerly needed large, multi-million dollar turbine aircraft or rotorcraft in order to carry dated, heavier technology can now utilize compact, advanced lightweight systems that Cirrus Perception supports. In addition to the special mission features, Perception-tailored aircraft come loaded with all the other benefits that come standard in the SR22 and SR22T airplanes. These include: the Cirrus Airframe Parachute System® (CAPS®), Cirrus Perspective by Garmin avionics suite, 210+ knot cruise speeds, Flight Into Known Icing (FIKI) capability, a useful load in excess of 1300 pounds, optional air conditioning, and the widest, most comfortable cabin in its class. "Cirrus Perception is revolutionary in the special mission market," continued Moser. "Our customers in military, law enforcement, surveillance, search and rescue, land surveyance and more can look forward to the adaptable nature of the Perception. We are excited to see this new platform utilized across a variety of industries." With recent FAA certification, the Perception is now available and will make its debut 18-23 July 2016 at the Airborne Law Enforcement Association (ALEA) Expo in Savannah, Georgia. Boeing (NYSE: BA) and Air Lease Corporation (NYSE: AL) announced an order for six 737 MAX 8s at the 2016 Farnborough International Airshow. Three of the orders are new, and three were previously attributed to an unidentified customer on the Boeing Orders & Deliveries website. The order is valued at $660 million at current list prices. "ALC already has lease agreements in place with seven different airlines for 737-8 MAX aircraft out of our Boeing delivery stream, starting in the fourth quarter of 2017," said Steven F. Udvar-Hazy, Executive Chairman of Air Lease Corporation. "The addition of more Boeing 737 MAX in our portfolio undoubtedly provides the economics, innovative efficiencies, and enhanced passenger experience that our airline customers are looking for in an aircraft." With 180 airplanes now on order, ALC has the largest backlog of any Boeing leasing customer. ALC also has the largest 737 MAX backlog of any leasing customer with 118 orders. "ALC was one of the first leasing companies to order the 737 MAX, and we appreciate their continued confidence in the airplane," said Brad McMullen, vice president of North America and Leasing Sales, Boeing Commercial Airplanes. "We're thrilled to see ALC place the MAX with airlines all over the world." The 737 MAX is the fastest selling airplane in Boeing history, with orders now totaling more than 3,200. The airplane incorporates the latest technology CFM International LEAP-1B engines, Advanced Technology winglets and other improvements to deliver the highest efficiency, reliability and passenger comfort in the single-aisle market. The new single-aisle airplane will deliver 20 percent lower fuel use than the first Next-Generation 737s and the lowest operating costs in its class - 8 percent per seat less than its nearest competitor. Japan's Mitsubishi Aircraft Corp on Monday said it had signed a letter of intent for orders of its new regional passenger plane with Swedish leasing company Rockton, in what would be its first European sale. The deal is for 10 firm orders with an option for an additional 10 and the two companies said they expected a definitive agreement "in the near future" in a statement on the sidelines of the Farnborough air show, southwest of London. Deliveries are set to begin in 2020. Hiromichi Morimoto, president of Mitsubishi Aircraft Corp, said the deal would give the MRJ90 program a "burst of momentum to expand customer base in Europe". The MRJ90 is Japan's first domestically-made commercial aircraft for about half a century. Japan-and its MRJ jet-are competing with other regional passenger jet manufacturers such as Brazil's Embraer and Canada's Bombardier. Mitsubishi unveiled the jet-which is 35 meters long and seats about 80 passengers-in October 2014. The short-to-medium-haul plane was backed by the Japanese government and a consortium of major firms including Toyota. "We find the MRJ airliner to be an exceptional product," Niklas Lund, president of Rockton, said in the statement. "This new aircraft will provide crucial economic benefits to airlines looking to operate in the 70-90 passenger size segment," he said. and make it possible to go anywhere on Earth in four hours. Developed by Reaction Engines over the last 20 years, SABRE (Synergetic Air-Breathing Rocket Engine) is a new engine class that can operate in both air-breathing and rocket modes. Joint commercial and government funding was secured in 2008 for a range of SABRE hardware demonstrations designed to elevate SABRE engine 'Technology Readiness Levels' to TRL 4 - 5, i.e. ready for full development. The Company has already successfully demonstrated a range of technologies for the SABRE engine, however the main focus has been on the successful testing, in the first half of 2012, of a SABRE Pre-cooler to test ultra-lightweight heat exchanger performance in a working environment. Though SABRE engines utilise many existing rocket and jet engine technologies, two key areas new to aerospace had to be addressed: ultra-lightweight heat exchangers and frost control. REL has focused primarily on developing these new technologies and the advanced manufacturing techniques required for their commercialisation. These cool the incoming airstream very quickly and effectively, from over 1,000 °C to minus 150 °C in less than 1/100th of a second (six times faster than the blink of an eye). They are extremely lightweight - approximately 100 times lighter than current technology - allowing them to be used for aerospace applications for the first time. The impact that these miniaturised heat exchangers will have on aerospace propulsion systems is comparable to the impact of the silicon chip on computing: new products, new markets, new capabilities. The Sabre engine can travel at 4,000mph, making it possible to fly from Britain to Australia in four hours. The engine could also mean that it's far easier to reach space - with the cost of putting cargo into orbit falling from £15,000 per kilo to £650. Instead of huge multi-stage rockets, a relatively light plane will take off from a conventional runway - and reach space in a single journey, without a pilot. A BAE Systems spokesman said, 'Once the technology is mature - in around 25 years - we aim to develop airliners capable of more than twice the speed of Concorde. The first demonstrator engine could be ready by 2020. Portugal, Montijo: A Lockheed C-130 Hercules of the Portuguese Air Force airplane has caught fire during take and crashed at the Montijo military base in Portugal. At least three people were killed in the accident, while the condition of three more crewmembers is being verified. The crashed aircraft was part of one of the cargo squadrons, providing logistic support to the Portuguese Navy. USA, Texas: A United Airlines Boeing 737 blew out two of its tyres when a pilot abruptly aborted its take-off from a Houston airport due to concerns about a possible mechanical problem. No injuries were reported among the 164 passengers and six crew members. USA, Texas: A Southwest Boeing 737 flying from Chicago to Texas was forced to land in Missouri Wednesday after encountering "severe turbulence" at 38,000 feet. A large section of the Midwest faced the potential for storms Wednesday as a cold front pushes east, the Weather Channel reported. Much of Illinois south of Chicago was under severe thunderstorm watches or warnings Wednesday, according to the National Weather Service. There were no injuries to any of the passenger or crew, a Southwest Airlines spokesperson said in a statement. Belorussia, Belarus: Several planes have been damaged by a storm at the airport in the capital of Belarus, with two aircraft colliding on the airfield. There have been no reports of injuries. The planes that collided belong to the Belarusian Belavia Airlines and the Ruby Star Air Carrier Company. The airport press service said that several windows in the airport terminal had been smashed and a suspended ceiling system was deformed in several places due to rough wind and heavy rains. Several flights were also re-routed to alternate airport in the Belorussian city of Gomel, and another was re-routed to the city of Vilnius in neighbouring Lithuania. There were no passengers on-board the two planes that collided. 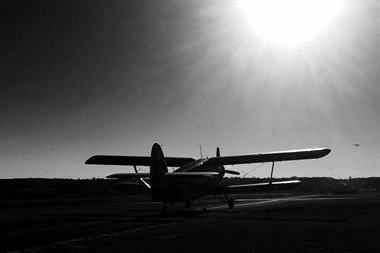 Wolfgang von Gronau sets out to make a round-the-world trip in a Dornier Wal. 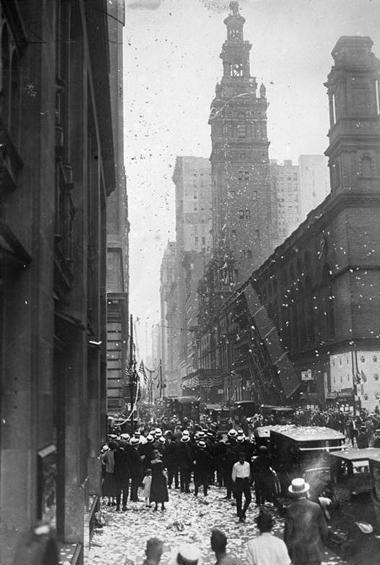 One hundred and eleven days later, it will be the first such trip made in a flying boat. Wolfgang von Gronau (1893-1977) was a German aviation pioneer. 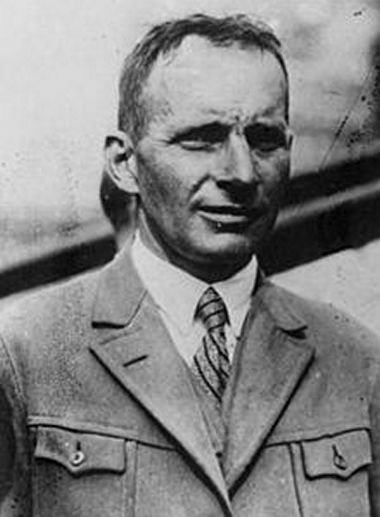 He made the first attempt to fly across the North Atlantic from the island of Sylt in 1929, but it ended in failure. One year later, he completed the feat in a Dornier Do J Wal ("whale"). The Wal was a twin-engine German flying boat of the 1920s designed by Dornier Flugzeugwerke. The Do J was designated the Do 16 by the Reich Air Ministry (RLM) under its aircraft designation system of 1933. The Treaty of Versailles signed in 1919 ended WW-I. The treaty forbid Germany's involvement in military aviation. German aeronautical engineers and designers concentrated on passenger-carrying aircraft. The Dornier works at Friedrichshafen on Lake Constance were producing a freight/passenger twin engine seaplane called "Wals" (whales). 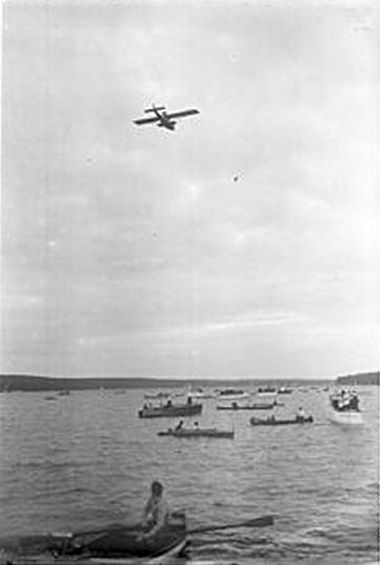 Wolfgang von Gronau was convinced that the Dornier Wals could be used to establish a commercial air route between Germany and the United States. The German government was not convinced of von Gronau's ideas even after he had made two successful round trip Atlantic crossings. To prove his case, von Gronau decided to make a third crossing. Once started, he decided to extend his 3rd trip to a round-the world flight. He hoped for world-wide recognition to get the attention of the German government for his air route ideas. On July 22, 1932 in a Donier seaplane called the "Gronland-Wal" (Greenland Whale) they took off from List, Island of Sylt (northern most part of Germany) for his Atlantic crossing flight which he changed to a round-the-world flight. He was accompanied by his co-pilot, Gerth von Roth and mechanic, Franzl Hack and radio operator, Frtiz Albrecht. They returned to Germany touching down at Lake Constance on November 9, 1932 visiting the Dornier works and then returned to List to make their mark completing a round-the-world flight.